Isla San Martin has maritime scrub vegetation dominated by drought-resistant shrubs and cacti. 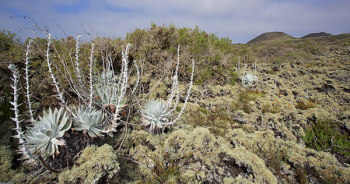 There is a small lagoon, coastal sand dunes, and coastal salt marshes.This small volcanic island is home to the large snowy white live-forever, Dudleya anthonyi, found only here. This page was last edited on 8 November 2018, at 23:32.